Picture this: you’re in a creative kick-off meeting surrounded with a team of multicultural talent. Take a second. Did what you envision reflect the reality of your company? Why is multiculturalism something our industry can easily imagine but not physically see around us? This is exactly the problem the 4A’s Multicultural Advertising Internship Program (MAIP) set out to address and challenge at its annual MAIP Summit. 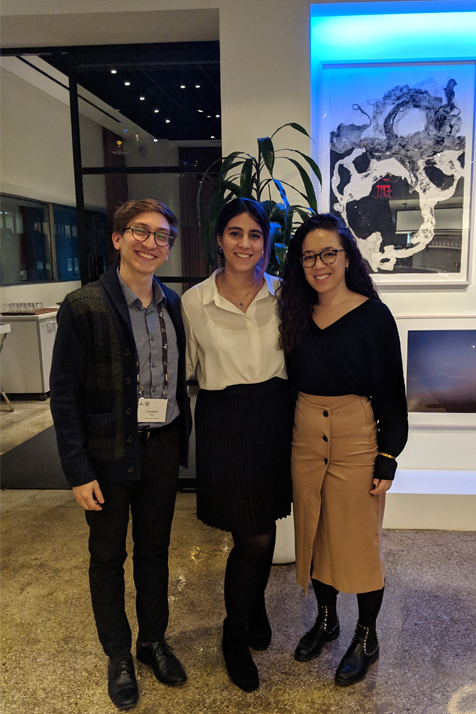 Last summer I participated in MAIP where I interned in Chicago at R/GA and actually visited C-K (Cramer-Krasselt) when they hosted the MAIP Summer Lab. And, now I’ve landed my first full-time job as Assistant Media Planner at C-K. One of MAIP’s strengths is its alumni outreach, which is how I got sponsored to attend the MAIP 2019 Summit. The event was jam-packed with industry trailblazers and thought leaders who spoke about topics such as identity and enduring microaggressions in the workplace. The collective unrestrained energy and empowered voices reinforced a sense of community and belonging that many people don’t feel at their agencies. While there is an inclination to gravitate toward people who look similar to those in your “tribe,” with MAIP, our tribe is surrounded with those who strive to make cultural change. Gianpaulo Pons (left) and fellow MAIP program alumni. Leaving the summit, three topics stuck with me and made me reflect on the opportunity that we have to continue to shape the industry around us. From a young age, people are always told to be a leader. While leadership is a great and necessary quality, it is also one of the hardest traits to change. You know what works best for you so adjusting your tactics for others can seem daunting and unnecessary. There were many important leadership lessons discussed at the summit by Darla Price, SVP, Executive Account Director at McCann Worldgroup. She talked about listening with your heart, knowing when to follow, and running toward conflict, but the most crucial takeaway was championing your people. Leaders have to create spaces for growth by guiding people to what they excel at, even if they don’t know what that is at the moment. And most importantly, trust in their success. A crucial part of that trust is giving a voice to those who deserve it, especially the multicultural groups who might not have had the opportunity in the past. I’ve been fortunate to work with mentors and supervisors, at R/GA and C-K, who understood the importance of this and allowed me to take ownership of projects and client presentations. For example, I was recently given the opportunity to present at a C-K new business pitch that I had been assisting on behind the scenes for over a month. Without this type of trust and encouragement, people won’t receive the necessary exposure to prosper; and in turn, leaders won’t succeed at creating great leaders. The “leaky bucket” phenomenon describes how multicultural (specifically people of color), mid-to-high-level professionals leave their positions due to a lack of cultural and professional support. This is caused by a system that focuses heavily on recruiting diverse talent but then leaves them to ‘learn on their own’ without any of the necessary tools and assistance to succeed and advance in their roles. This issue came up a few times during the Q&A portions at the summit. One MAIP alum described how she was tired of having to explain her background and defend her work to coworkers and supervisors alike just because of her dark complexion. Some people might scoff at this and call it an assumption, but when you’re the only minority you can quickly see how people interact differently with you. And, although organizations like MAIP are giving students the best first step into the industry, it’s hard to know when the leak will end without the support of impactful coaches and culture-driven agencies. This is why it’s imperative for companies to not only hire diverse people but invest in their skills, career growth, and happiness. Focusing on these three key points will develop stronger leaders and retain exceptional talent. Although there is a lot of progress still to be made, it’s a healthy process to take a moment of peace and visualize the steps the industry has made throughout the years (e.g. Time’s Up, multiculturalism in ads, etc.). Whether you started a Diversity & Inclusion (D&I) initiative at your agency or thought of a great new way to provide team feedback, it’s comforting and constructive to have a few “humble brag” moments. It can be as simple as telling a coworker about your success. And who knows, maybe that’ll push them to follow suit and make changes on their own. I have personally seen this at R/GA where MAIP alum E.J. Stancil worked with HR and VP executives to introduce more D&I events throughout the year, not just for specific holidays. His co-workers and I were so captivated with his passion for community that we wanted to be involved in any way we could. The idea is to feel proud of your strides and to not fear taking up space with your presence, especially when you doubt yourself or abilities. We all know that diversity is important and necessary for a business, its work, and most importantly, its people. But when we talk about diversity, we shouldn’t just think about someone’s appearance, we should also champion for diversity in things such as cultures, backgrounds and experiences. Diversity isn’t something to play out like you’re collecting baseball cards; it should be about empowering independent thinking to strengthen our client’s creative work and our company’s culture. We can’t wait for D&I teams to initiate change because culture is everyone’s job. Gianpaulo Pons is an Assistant Media Planner at C-K and serves on the agency’s Diversity, Inclusion and Belonging Committee. He is a 2018 MAIP alum who interned for R/GA as a Media Intern. In 2018, he graduated from Boston University with a BS in Communication and concentration in Advertising. Follow the 4A’s at @4As and MAIP at @MAIP. C-K is actively involved in MAIP as well as other programs to attract and retain diverse talent. The agency sponsors MAIP fellows and has hosted a MAIP Summer Lab for six consecutive years.